In June 2015 Brian Trotter, Simon and Otto Peetoom discussed The Southern Africa Philatelic Conference. It is an informal and relaxed philatelic weekend and it continues to enjoy considerable support from members of the various Southern African philatelic societies. We agreed that it would be worth expanding the concept by adding a journal and website to this open forum. The idea behind the open forum is that it is not a society and does not have membership charges. Each individual attending the annual conference pays for their own hotel room and associated costs. We hold an auction at the conference and the commission from this has continued to accumulate and ought to be devoted to promoting Southern Africa Philately. The late Tony Chilton had put a paper together to highlight some of the difficulties societies were facing with an aging membership and a small number of members serving on the committees of more than one society. From Thursday 28th to Saturday 30th November 2002 members of various Southern Africa Societies gathered for their first ever joint conference which included members from the Anglo Boer War, Bechuanaland & Botswana, Cape & Natal, Orange Free State, Rhodesia, South Africa and Transvaal study groups. Eddie Bridges conducted a successful auction which became the traditional end of conference event. Unfortunately by the time the event took place, Tony had passed away, however his paper was read and discussed, but his suggestions did not find favour. However, the Chester conference had laid the foundation for an annual Southern Africa conference. The following year Brian Trotter and Eddie Bridges took on the organisation of the annual event and it developed into a highlight for those interested in Southern Africa Philately. The second Southern Africa Conference was at held at The Falstaff hotel and a report appeared in The Springbok No 284. All subsequent Conferences have been staged at The Falstaff hotel in Leamington Spa. 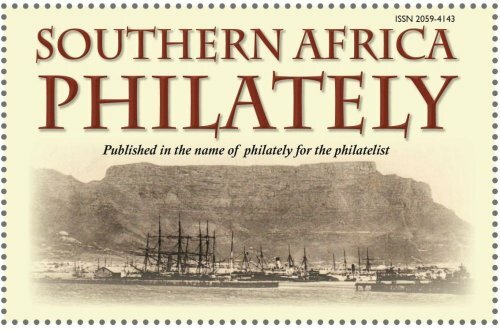 For more details click here Southern Africa Philatelic Conference. Click on the link to subscribe to Southern Africa Philately and become a part of the open forum! The first edition is free to download now.